A new, international poster has been released for the Assassin's Creed movie and for the first time, it's not all about Michael Fassbender. Up until this point, every poster has seen the main man at the centre of things, but now the rest of the cast is stepping into the spotlight. Ok, so Fassbender's Aguilar de Nehra is still featured heavily, but alongside him is Marion Cotillard’s Sofia Rikkin, her dad Jeremy Irons’ Alan Rikkin, fellow Assassin Maria (played by Ariane Labed), and head of the Templar army during the Spanish Inquisition Ojeda (played by Hovik Keuchkerian). With the second trailer for the Assassin's Creed movie still making our heads spin, another poster for the video game movie has also been released. 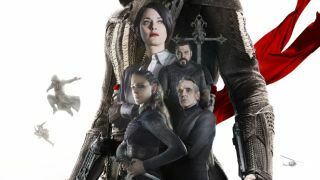 This poster highlights the dual characters Michael Fassbender is playing, with hooded Assassin ancestor, Aguilar de Nerha, on one side and present-day dweller, Callum Lynch, on the other. Scroll down to see it in full and for the rest of the Assassin's Creed movie posters that have been released so far. We've had our first look at the trailer for Assassin's Creed and now we've got not one, but two posters showing Michael Fassbender in traditional Assassin's Creed poses. One shows him taking in a viewpoint from the top of a very high building, and the other shows him making a leap of faith. If that's not enough free running for you, check out our Assassin's Creed set visit and thoughts on the first fifteen minutes.